Great post! This line in particular struck me “…we evangelicals tend to tend to sweep Lent and Easter under the rug.” Now as an evangelical I would rarely sweep Easter under the rug but Lent of course could typically go out with the dishwater. However, back in my Anglican/Episcopalian days I would rarely do anything for Lent but now as an evangelical Baptist I appreciate the idea of Lent even more! Thanks for bringing this to my brain today! Thanks for visiting! I think it’s interesting that you appreciate the idea of Lent more as an evangelical than as an Anglican. That’s an interesting perspective. And I should be clear – I know that not all evangelical churches brush off Easter. But because evangelical churches are purposefully disconnected from any broad standard of exactly what must be communicated during services, there’s a huge variety in what religious holiday worship looks and sounds like. I’ve heard Easter sermons that either didn’t acknowledge it was Easter, or did so without saying Jesus rose from the dead! This isn’t common in all evangelical churches, but my point was that we generally give more attention to Christmas than Easter. Thanks for having a place to visit! Your point is well taken and something that we must avoid! Christmas is the season of Christs birth but Easter is when He defeated death! 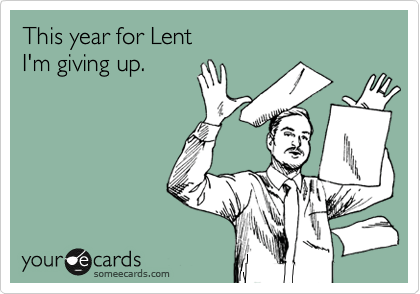 Yeah for Lent! It really is my favorite Church season.